Whether you’re arranging a competitive tournament, charity event or a recreational day, we offer a variety of tournament activities and services that suit all ranges of physical abilities. Our knowledgeable staff will arrange every detail of your tournament from event structure, sponsorship sign placement, player management, and dining options to ensure that your tournament runs seamlessly. Whether you're arranging a competitive tournament, charity event or a recreational day, our 2 golf courses offer a range of conditions and challenges that suit both the novice and seasoned golfer. Our knowledgeable staff will arrange every detail of your day from event structure, sponsorship sign placement, specialty-hole suggestions, player management, and dining options. 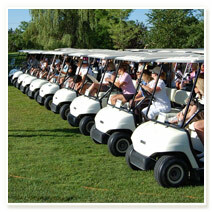 Our goal is to ensure your golf event runs seamlessly, allowing even the tournament organizer to enjoy the day! Visit our Golf Tournaments page for more details. Group rates are available for overnight guests. Call for details. Immerse yourself in your hockey experience. The Centre Ice Sportsplex arena, located on the resort grounds, provides athletes and coaches with something that is rarely afforded during a hectic training and game schedule – time to unwind. With everything at your fingertips, the possibilities during your stay are unlimited. What you will find here is unique in the industry. 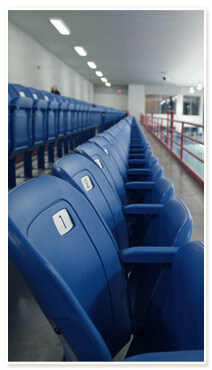 The hockey arena is just steps away from the hotel, eliminating travel distractions completely. Put on your game face during the day and enjoy the freedom of a getaway during the evening. Whether you choose to relax in the comfort of your room, satisfy your hunger with quick bite or a full sit down gourmet meal, or enjoy the extensive line-up of resort amenities at your disposal, you will quickly discover that a tournament with us is more than just ice time. Join us for your next hockey tournament, hockey skills development or hockey training camp and discover what a hockey experience should be. A soccer experience like no other. What you will find here is almost unheard of outside of the professional soccer world - pristine soccer pitches where the ball rolls true. Our fields, both international and regulation sized, are professionally maintained daily to the highest standard to ensure that the turf conditions are some of the best you will find available anywhere. Located steps away from the hotel, on the resort grounds, travel distractions are completely eliminated, allowing you to focus your team on the soccer training schedule. Understanding that a soccer training session is more than just on-field time, private meeting rooms are available for instructional training, massage therapy and equipment storage, are just some of the many benefits of holding your soccer training camp here. More than just a place to sleep, coaches and teams enjoy the freedom of selection; spend your down time enjoying the comfort of your room, sampling culinary excellence in one of our three restaurants or strengthening your team dynamic while participating in our extensive line-up of resort amenities. Every aspect of your stay will be carefully arranged by our knowledgeable team, from specialized dietary menus to personal training, to ensure that you gain the maximum benefit from your training camp. Mouth watering barbeque aromas from sizzling meats deliciously prepared for your tournament group. After enjoying a day of recreation, sit down to a well-deserved barbeque dinner featuring a line-up of delicious barbeque favourites. 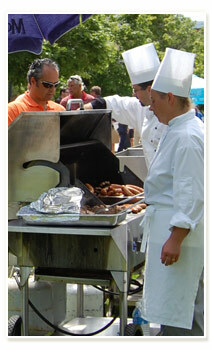 Ideal for tournament groups, our casual buffet barbeques continues the relaxed flow of the day. Whether you decide on a pre-selected menu or to customize your own, to dine indoors or outdoors, a barbeque dinner is a great tournament compliment. Golf tournaments on the Ridge Course have the opportunity to arrange a private barbeque dinner on the patio. For details, dinner and refreshment options and availability please contact our Conventions Department.